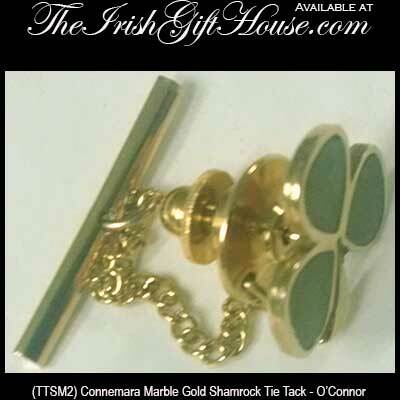 Celtic tie tacks or an Irish tie pin may be the perfect accent for your necktie or for your lapel. 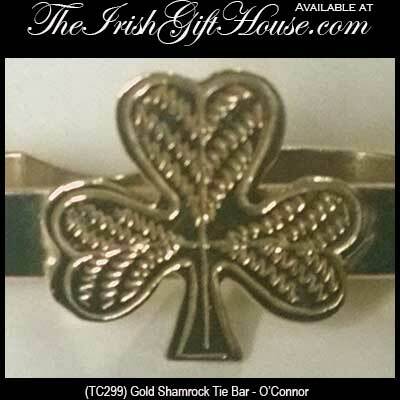 Show your Irish pride with a tie accessory from The Irish Gift House that includes tacks and bars with Celtic knot designs along with shamrock or Celtic cross designs. Celtic pin or tie tack features a Trinity knot with green enamel accents on a gold tone metal base. Shamrock tie tack or lapel pin is a rhodium plated design that is enhanced with green enamel accenting. These Irish and Celtic tie accessories are a perfect way to augment your Celtic cuff links or your Celtic knot wedding band. You will also find additional selections on our Irish costume jewelry page. And ladies, you may also wish to add a complimenting Irish jewel of your own, so please browse the Celtic brooches for a start. You may wish to continue browsing with our assortment of Celtic cross necklaces for men where you will find masculine designs in both sterling silver and in gold.